POLICE in the Port of Spain, Western and Central divisions were kept busy up to late yesterday investigating the murders of seven men with the latest being Phillip Bassant, the brother-in-law of murdered Chaguanas businessman Sheron Sukhdeo who was gunned down six weeks ago. Bassant is the brother of Sukhdeo’s wife Rachael Sukhdeo. Bassant’s killing happened at about 5.45pm yesterday close to where Sukhdeo was shot. Bassant’s killing, according to senior police within the Central Division, is being linked to the deaths of Joshua Plaza, and Sukhdeo. Senior police said the reports of a white car passing and a shooter coming out killing Sukhdeo was false and Bassant and Plaza played critical roles in Sukhdeo’s murder. Sukhdeo was gunned down on March 26 while at the home of his in-laws. He was cremated a few days later. Plaza, of Savannah Heights, Charlieville, was at home at around 3.45 pm on April 22 when he received a phone call from someone who told him to come outside. When he did he was gunned down. Police said a white car passed and one occupant opened fire on Bassant killing him on the spot. Both Plaza and Bassant were present when Sukhdeo was shot. Bassant’s killing comes one day after police visited the car dealership that belonged to Sukhdeo and seized several vehicles. The deceased millionaire’s dealership was raided on April 20 as well after reports of two stolen vehicles were allegedly found on the compound. During that seizure Sukhdeo’s widow was arrested and later charged with assault and obscene language. Police said given their information, there will be more attacks on people that are closely connected to Sukhdeo as there is a belief that he was murdered by his friends and not his enemies. At about 1.15 pm, an unidentified man was killed while walking on Upper Oxford Street, East Port of Spain. Residents reported hearing gunshots and found the man’s body on the street. Inter Agency Task Force (IATF) officers were on patrol in the area at the time. The man, who was wearing a blue vest and red short pants, was described as a stranger by residents. However, a group of women, who appeared to be his relatives, were seen arriving shortly after the shooting. And labourer Devon Gregoire, 35, was shot and killed while asleep at his Freedom Hill, Cocorite, home at about 2.30 am yesterday. Gregoire, a construction worker, was in the bedroom when his killer reportedly broke a window and shot him twice in the face. Before viewing his body at the Forensic Science Centre yesterday, Gregoire’s mother was overcome with grief and had to be assisted to and from the facility. “He didn’t deserve to die like this. He was a hard-working guy, and besides his children and his job, he loved his vehicle. He only wanted the best for those around him and it’s sad what people are doing with this whole gang foolishness,” one relative said. 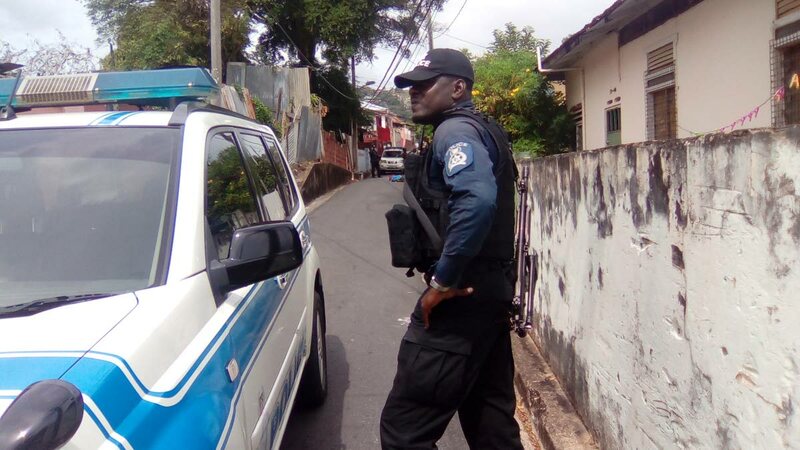 At Morne Coco Road, Petit Valley at about 4.10 pm on Thursday, residents were sent running for cover after a hail of bullets killed two men and wounded four others. Allan “Spanish” Lopez, 35, and Jordan Gibbs, 22, were killed while playing cards near the village recreation spot known as the “Cocoa Jar” when several gunmen shot them multiple times. Newsday understands that two of the wounded are said to be in critical condition at the St James medical facility. The gunmen escaped in a Nissan AD Wagon, which was found by police from the West End Station. Newsday spoke with Gibbs’ relatives at the Forensic Science Centre. They said they were deeply troubled by his death and Gibbs would have been expecting his first daughter in the next three months. They said his father was also shot dead exactly 40 days ago. “This honestly feels like a bad dream. I woke up this morning and kept thinking I was going to wake up,” said one relative. He also lamented that instead of celebrating the birth of his daughter, relatives must now make arrangements for Gibbs’ funeral. According to reports, Gibbs was shot 14 times. Lopez’s relatives, admitting he had convictions for drug use, said he had received several death threats in the past from people who were “envious” of him. Despite this, relatives insisted, he was trying to turn his life around and be the best example for his two teenage sons. One of his cousins said despite their differences, he would be missed.